As many of you may remember, I'm an unabashed artichoke-lover. I've always known that California is the de-facto artichoke capital of the world -- who knew a thistle could be such a mysterious and varied object? One of the most exciting things for me about my move from NYC to CA has been the anticipation of trying the best of the BEST close to the source. Tonight was the first dinner including fresh California artichokes that haven't been shipped cross-country but rather cross-county. Wow. They were spectacular. I created a "California Artichoke with Rustic Herb Hollandaise". We were honestly licking our fingers, hands, elbows and wrists they were so damned juicy and good. What's particularly wonderful about this dish is that I don't have much to work with at the moment in terms of kitchen, kitchen utensils, stove or kitchen appliances. Yes, I've gone backward temporarily from my spectacular New York kitchen, to a terrible one. We're currently living in temporary corporate housing which means sterile, mundane and bland. Oh, and all my knives, pots and pans and cooking equipment is in a huge storage container on a palette in a warehouse in Oakland. So. I'm stuck with "steaknives" probably purchased at The Dollar Store that break off at the hilt when cutting a piece of crusty bread. People often ask me what a good raw artichoke looks like. This, my friends, is a great example. It's bright green, its leaves are tightly bunched together (rather than spread open) and it has few mars and blemishes. Yes, there are always some, but you shouldn't see huge patches of brown and spots. Only little ones. It's heavy and bulbous. These are just two good ones. They're not perfect, they're not amazing. But they're very good. And I didn't get them directly from a farmer. Not yet, not this time. I suspect that Scrumptious Street will o.d. on artichokes in the next six months, since we're heading into prime season for some of my favorite varieties and I intend to hunt those farmers down to get the very best ones. I warn you now. One day, I promise I'll do a post with a video of exactly how to de-construct an artichoke. But that will at least have to wait until all my camera gear is out of storage too. Currently I just have my camera and no lighting equipment, tripod, backgrounds, props or styling aids. So, the photography is pretty basic until I can get my hands on my own stuff again. I think these photos look pretty decent considering how little I have to work with at the moment, so that's another reason these artichokes were so impressive. My notation of my recipe was a little slacker than normal, due to the hectic nature of life right now. So, here's the general notion of what I did and if anyone has questions, please don't be shy! Comment, email and ask whatever is on your mind. 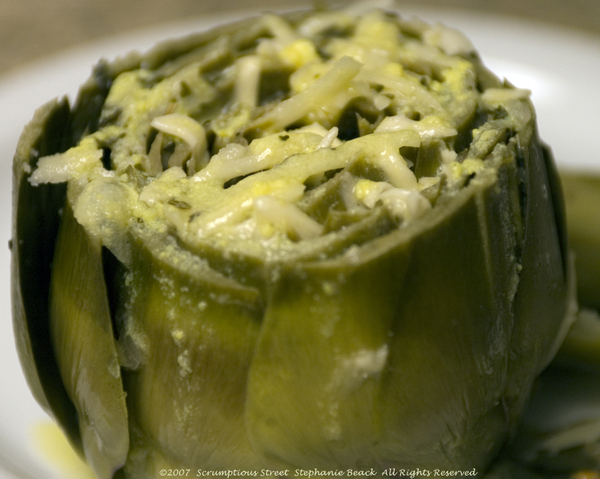 I like doing artichokes many ways and sometimes I can't decide between stuffed or steamed with a dipping sauce. Tonight it occurred to me to try a combination of the two concepts. I stuffed them with shallots and pecorino-romano cheese. I braised them as usual in a very aromatic water-bath. And, I wanted a sauce but one I could spoon over the artichokes due to the stuffing so I did a riff on a hollandaise sauce that was intentionally rustic and dripping so it would seep down into the artichoke instead thick like a mayonnaise or aioli dipping sauce. I also omitted the cayenne pepper, which is often part of a traditional hollandaise. Mr. Scrumptious and I both really loved it. 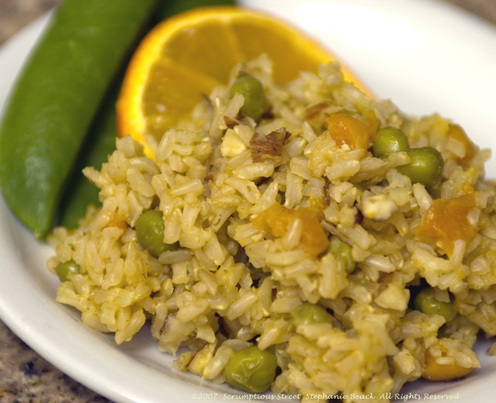 It worked out terrific and was delicious and flavorful without being rich or heavy. It was a perfect appetizer or side dish that would work with so many other kinds of main courses. There was still extra sauce for dipping or to be used for another purpose. (Brunch anyone??) Here's how I did it. 1. Clean and trim the artichokes by cutting off the tops, snipping all the outside leaves and breaking off the brittle leaves on the bottom near the stem. Cut the stem off. Rub the cut areas with lemon and place into large bowl of cold water with lemon juice squeezed in. 2. Place the cleaned artichokes, garlic, bay leaves, the quartered shallot and lemon slices and salt into a large pot of water. If you have some dry white wine, put in about 1/4 c. Bring the water to boiling and then immediately turn down to medium and below a boil. You want a good strong simmer. Spread open the leaves slightly and stuff the diced shallot evenly into the leaves. Make sure the artichokes are sitting upright. Cover the pot and let cook for 30-35 minutes or until an outer leaf comes off with a bit of tugging and force. 3. Drizzle the olive oil over the artichokes down into the leaves and let cook another 10 minutes, uncovered. 4. Make the hollandaise sauce. I wanted this rustic and chunky, not creamy-smooth so I used the lemon juice WITH pulp and I also let the sauce "break" which happens when it cooks slightly longer at higher heat than a true hollandaise should and the sauce begins to separate. This is what I needed in this dish, so that when I plated the dish the sauce would run down the leaves and coat them with flavor. It worked great! To make the sauce melt the butter in a small sauce pan over low heat. Add the lemon juice and pulp. Separate an egg and whisk the yolk in a small dish. Spoon it into the saucepan and whisk into the butter when it's melted. Add the basil. Whisk until the sauce is thick and creamy. Add sea salt and white pepper to taste. I did about 4 turns of the salt grinder and 8 turns of the white pepper grinder. Continue to whisk until the sauce begins to thin out again. Remove sauce from heat and set aside. 5. Test and make sure your artichokes are done. Do this by using a fork and gently poking one of the outer leaves. It should come away easily. Let the leaf cool and then test by tasting the leaf and scraping the flesh off with your teeth in the usual fashion. When done, turn off the heat or gas and gently stuff the cheese down into the leaves by spreading them open with a spoon. Cover with a lid for 2 minutes so the cheese can melt. 6. 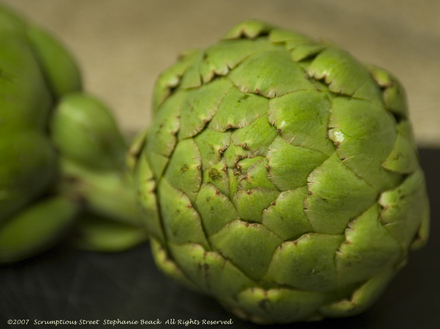 Gently remove the artichokes from the pot with tongs and let them drain of water. Slide them onto a plate. Spoon the herb hollandaise sauce over the artichokes (as much or as little as you want, you'll have extra) and serve immediately. Enjoy!